Our health and safety consultants specialising in first aid have not only a robust understanding of legislation and guidance on first aid at work but also its practical application in the workplace. Our specialist consultants have over fifteen years’ experience undertaking first aid needs assessments in variety of environments from large organisations to those employing peripatetic workers or working from home. As the number of different options for employers to consider with regard to the provision of first aid in the workplace continues to grow, we are able to provide clear advice and guidance in relation to the specific needs of your business including options such as the provision of oxygen and AED’s. 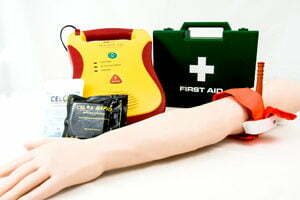 How do we support customers with a first aid needs assessment? Using our experience and reference to a wide range of published guidance and legislation we initially advise you on your statutory duties. We’d also take in to consideration any specific needs your organisation might have, for example other persons you might be required to treat over and above your employees. This might include children, other contractors or members of the public depending on your business. We’d also review accident/incident trends using this information to comment further on the type of first aid training or equipment most suited to your working environment. This information would be used to create a detailed first aid needs assessment that covers all areas of a business including regular employees, remote/home workers and others, for example those who drive during the course of their work.